It's time to reach down into the bottom of your desk, get out your slide rule, an abacus, a quill pen, and a piece of carbon paper. We'll take a look at the turnout and election returns from this Tuesday's special election, and see if there are any clues pointing the DCCC where they should go next. Special elections are won as much on turnout as on issues or TV ads. Why? Since the number of voters in a special election is small compared to Presidential or even midterm elections, it's possible to score an upset victory by dragging more of your supporters to the polls. To give you an idea of what kind of effort we're talking about, around 80,000 people in the Ohio 2nd voted for Kerry; Hackett could have won the election simply by finding another 5% of those people and making sure they vote. We can get a sense of which counties had the most "retention" -- the percentage of Presidential voters who came back for a second helping in the special election -- by looking at the turnout rates from 2004, then comparing them to the turnout from the 2005 election. We see immediately that the residents of Scioto County, and to a lesser extent Hamilton County, were really excited to go cast a ballot in this congressional race; we don't know who they're voting for yet, but they're excited to go vote for someone. Meanwhile, the good people of Pike County and Warren County are either too busy to go vote, or they don't feel that either candidate is speaking to their worries. It's important to go beyond turnout and look at the actual vote count to figure out where Hackett succeeded in making gains at the polls and where he didn't (yes, I know this is not rocket science, but it never hurts to repeat yourself. Or so I'm told). Comparing the Hackett-Schmidt race to Rob Portman's recent congressional races isn't really a fair comparison though; Portman's challengers where not particularly serious, and such a comparison would overstate effectiveness of Hackett as a candidate. Instead, let's compare the special election returns to the 2004 Presidential Election, which was very hotly contested in Ohio. The swing towards Hackett -- just over 12% across the district-- would be enough to take 50 seats in the House and give Nancy Pelosi the Speaker's gavel, if they could reproduce that result nationwide. As I've said before, how much of that 12% gain is attributable to Hackett the candidate versus a general shift against Bushim and/or Taftism is unclear. But even a 6% gain would give the Democrats control of the House, although it would require reliance upon Blue Dog Democrats and the few moderate Republicans to maintain a governing coalition. The Schmidt campaign did do a better job of holding ground in the GOP "base" counties of Warren and Clermont than they did in the pure rural areas; however, base voters did not turnout in particularly high numbers. This may signal some dissatisfaction at Republican government within their own electoral base. Also, when combined with the turnout data, the election tally suggests that Hackett either concentrated his field campaign in Scioto County, or there are a lot of people there who are really P.O.ed about the state of the world today. Looking ahead, what are the key takeaways for Democrats in 2006? The biggest lesson is that there is a clear split between pure rural areas, small towns, and "exurbs". The exurban counties of Warren and Clermont were so heavily Republican in 2004 that even a 12 point swing resulted in a GOP landslide; in addition, the Republican candidate held her ground . On the other hand, Adams and Brown Counties, which have the smallest populations, swung the most towards Hackett. The next lesson also comes out of the surprising rural swing towards Hackett in rural areas. 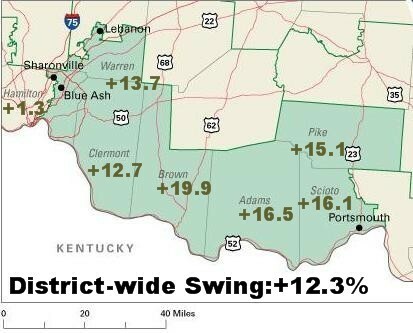 Democrats have a terrific opportunity to make sweeping gains at the local level in Ohio. It would behoove the Progressive Majority to find Democrats who want to run for office -- County Commissioner, mayor, probate court judge, cemetry commissioner, you name it -- in Brown, Adams, Scioto, and Pike Counties. Winning local elections is hugely important work, since it both shows residents that Democrats can govern and builds the bench for future election. The third lesson is to show these rural areas some love. They don't get a lot of attention in national elections because of the perception that there aren't enough votes to matter, and Democrats are better off just trying to squeeze a few more voters out of urban areas. But the Hackett election shows that rural voters can be comvinced to vote D if the right candidate comes along. Perhaps this is a result of a lack of higher education, leading to more dinner table politics; perhaps it's a result of more intense local media coverage; perhaps something else. But a nationwide swing of 12-15% of "Country Folk", who compromise 21% of the population, would be enough to make Democrats the majority again. The fourth lesson is that Mike DeWine might want to buy a new set of golf clubs, because he's going to have a lot of free time starting in December of 2006. I would add that it would also behoove Democrats to start treating the gun issue less as a hunting & sporting issue and more as a self-defense issue. Hackett got grilled by Chris Matthews for having a concealed-carry permit, which you wouldn't need if you're a hunter. You would need it, however, if you were packing heat for protection. I know for a fact that several of my friends in Cincinnati voted for him for that reason. Now, I'm not holding my breath that this will happen; but if it does, it effectively removes the NRA as a factor. The main reason gun groups do well is because they market guns as a means of protection. If both parties recognize that guns can be used in that manner, then the NRA is neutralized as a factor, which removes them as a barrier to attracting rural votes, and allows us to pivot to the economic argument. Trying to determine a general trend from a special election is usually pretty foolish. You really can't compare them to any regular election. For Democrats (in Ohio and Nation wide) this election was a referendum on Bush. A way to show how unpopular Bush was, and it aquired Mythic status. For Republicans, it was at most important as a means of keeping this Democratic myth from being true. Obviously, one's own myth is more important than preventing someone else's. Nicely done Nick. I need to swing by this way more often.